Born Mar 4 18871,2,4,5,6 [Mar - 18868], Mud Lick, Chatham County, North Carolina1,2,4,5,6 [Alamance County, North Carolina7]. Rhodes, George K., head-of-household, age 40, born in North Carolina; parents born in North Carolina; second marriage, married 2 years; occupation: laborer, cotton mill; rented home. Rhodes, Ida L., wife, age 42, born in North Carolina; parents born in North Carolina; second marriage, married 2 years; 7 children, 5 living. Hinshaw, Iniz M., step daughter, age 18, born in North Carolina; parents born in North Carolina; first marriage, married 2 years; occupation: topper, hosiery mill. Hinshaw, Walter U., step son-in-law, age 22, born in North Carolina; parents born in North Carolina; first marriage, married 2 years; occupation: knitting, hosiery mill. Scott, Lacy C., step son, age 14, born in North Carolina; parents born in North Carolina; occupation: topper, hosiery mill. Scott, Lottie R., step daughter, age 13, born in North Carolina; parents born in North Carolina; occupation: topper, hosiery mill. Scott, Worth B., step son, age 10, born in North Carolina; parents born in North Carolina. Hinshaw, Walter U., head of household, age 32, born in North Carolina; parents born in North Carolina; owned home; occupation: hosiery mill. Hinshaw, Iniz, wife, age 27, born in North Carolina; parents born in North Carolina; occupation: hosiery mill. Hinshaw, William C., son, age 5, born in North Carolina; parents born in North Carolina. Hinshaw, Walter [..middle initial unclear..]., son, age 2, born in North Carolina; parents born in North Carolina. Scott, Ida, mother-in-law, age 52, born in North Carolina; parents born in North Carolina; widow; occupation: house work. Hinshaw, W.U. Mrs., head-of-household, age 37, born in North Carolina; parents born in North Carolina; widow; first married at age 16; owned home ($5000 value); radio in home; occupation: looper, hosiery mills. Hinshaw, Curtis W., son, age 14, born in North Carolina; parents born in North Carolina; attended school. Hinshaw, W.U. Jr., son, age 12, born in North Carolina; parents born in North Carolina; attended school. 1920 census, Burlington Township, Alamance County, North Carolina; roll T625-1282, ED 16, page 13B, line #84, dwelling #255, family #256. 1910 census, 4th Ward, Burlington, Alamance County, North Carolina; roll T624-1095, ED 16, page 242A, line #21, dwelling #150, family #151. 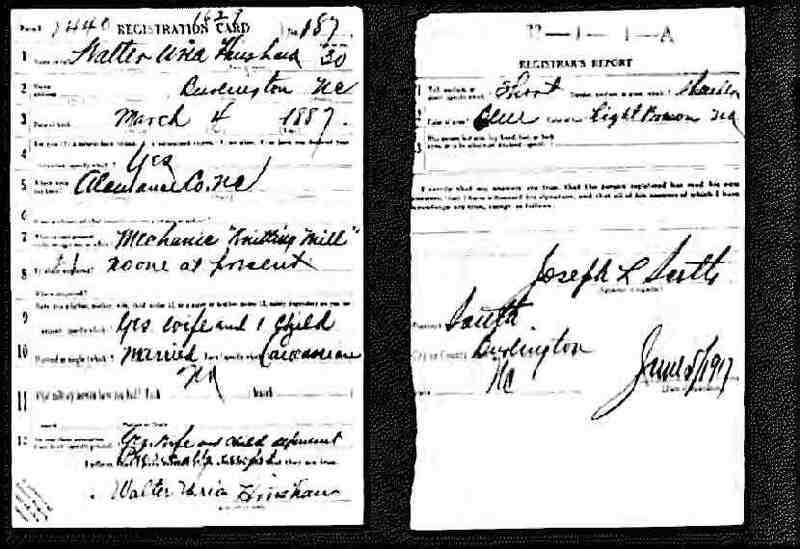 1900 census, Burlington, Burlington Township, Alamance County, North Carolina; roll T623-1180, ED 13, page 21A, line #9, dwelling #381, family #381.